We protect our plants from winter's harsh weather with a layer of straw mulch. The idea of mulching is to insulate the ground once the soil has been exposed to a slow decrease in temperatures below 0C and to keep it frozen until spring. The mulch will help in moderating fluctuations in temperatures by keeping the plants safe from sudden cold snaps or thaws in January, which will often result in the garlic bulbs heaving from the ground. Often cracks develop right along the row of garlic and expose the cloves and their roots. Straw is one of the best mediums to use as its easy to find locally and usually doesn't have many seeds of its own to germinate.Straw will hopefully suppress weeds already present in the soil from germinating in the following spring. I say hopefully because no matter how much mulch I put on the garlic, weeds find their way to the light and germinate . Leaves are fine to use too as long as they are shredded. by chopping the leaves into smaller pieces it will result in less compaction. Compaction is when the leaves form a barrier over the soil and not allow rain thru or clove tips to emerge. Timing is critical for mulching in order to safeguard a spring crop like garlic from the vagaries of winter. I wait until the ground is frozen before I mulch and usually I time it around the end of November or the beginning of December. Remember, the idea is to keep the ground frozen once it is frozen. This winter has been a little different for us in Central Hastings County. Winter didn't come until after the end of December. The ground just wasn't freezing up on time. I did begin with some mulching on November 29th since the ground was actually frozen for few days, but promptly thawed again. I covered 9 beds then. Sometime during the Holidays, we received our first 14 inches or so of snow over a few days! Well that is good enough for me to safely continue with mulching. I waited a week or more to allow the ground to freeze under the snow. 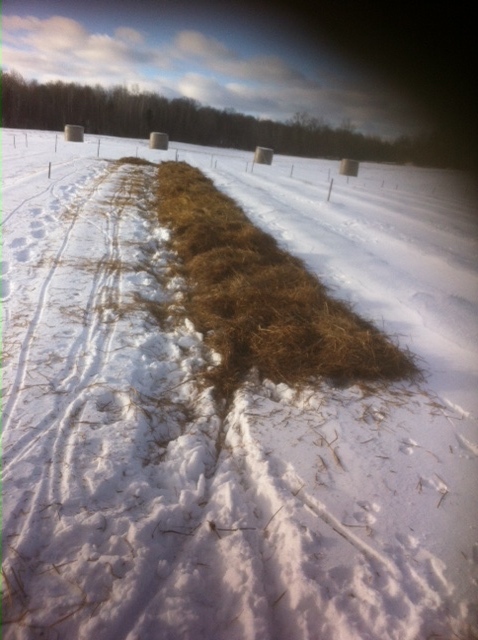 I mulch right on top of the snow and use the snow as extra insulation, it has two layers of insulation, one of snow and one of straw. So now the ground should be somewhat frozen and well protected for the rest of the winter. Over the next week i will keep on chipping away at the frozen straw bale and finish the mulching soon. Come spring time, I will remove only some of the straw, usually around end of April or the beginning of May. I try to remove part of the thicker clumps and leave an even covering over the garlic. The garlic will push through fine. However, walk each bed and check if any leave tips are not able to push thru and i help them out by removing the mulch. As spring moves into summer, i find that i will have to begin serious weeding. by the end of June i will have made one pass and possibly even two. the straw breaks down, blows away or just simply disappears. Maybe the nesting birds in the fence lines are using straw to build nests.